Choose from beautiful plaques, various trophies, resin statues, medals and acrylic awards for your racing and showing event. Scroll this page to get a brief description of each award, you can get more information by clicking on a picture. We think you will find our car and racing awards to be of good quality, very economical and we have a reasonable turn around time. 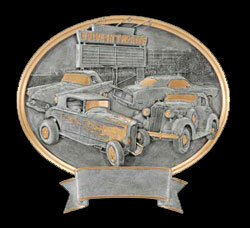 These plaques are designed to be a hit at Classic Car and Antique Tractor Shows. Choose a Solid Walnut, Walnut Finish or Black Marble Finish plague. 40 characters of free engraving are included with each. New and unique Resin Car Show Plaques are great looking and don't put a strain on your budget. Click the button for more information. Our slide-in plaques allow you to use a team or individual's picture. Plaques are available to accommodate picture sizes from 3.5 x 5 up to 8 x 10 inches. They have ample engraving space and engraving is only 7 cents per character. Click the button for pricing and more information. If you are looking to purchase trophies, large or small. We offer the simple and inexpensive base figure up to a 4 foot 4 post trophy and a lot of trophies in between. The trophy at right is shown with basketball figures but we have a large selection of car and tractor figures you may choose from. Click here to see our car, truck and tractor figures. Resin Statue Awards may be the best value in our trophy line. They are very detail in a variety of poses and include 40 characters of free engraving. Click the button for more information on cost and details. Acrylic Car & Racing Awards are very cost efficient trophies. Select from 3 styles and 2 or 3 sizes depending on the style selected. You get 40 characters of free engraving with each trophy. Click the button to view the cost and details of our Ice Awards. Check out our Placing Medal Selection. 4 different racing and car show medals. Choose gold, silver or bronze color, if you need a neck ribbon we have a large selection of colors. Click picture or side bar link to view cost and details.